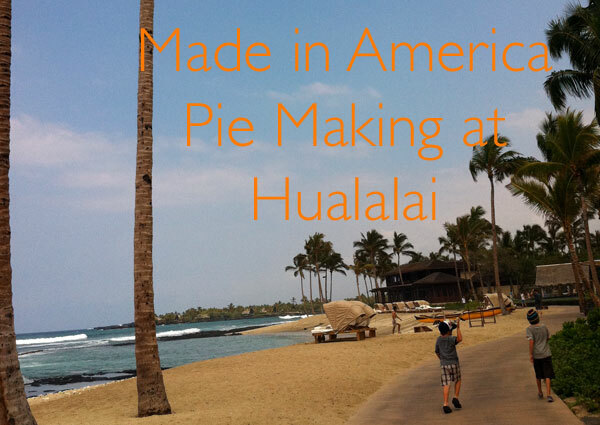 One of the highlights of our recent trip to the Four Seasons Resort Hualalai for Made in America was a pie making class with Chef Linda Rodriguez. At Made in America in Hawaii back in October we held our first pie class with the Queen of Pie, Chef Evan Kleiman and Chef Ludo Lefebvre took part. I would start with the Apple Chess Pie recipe in Made in America from Evan Kleiman (super easy to follow) and if you haven’t already done so I recommend you download her app – Easy as Pie and get baking. I missed having both Evan and Ludo in the class this time but instead for a couple of hours I managed to get Minty and Rémy away from King’s Pond and swimming with the fish to come and bake with me. 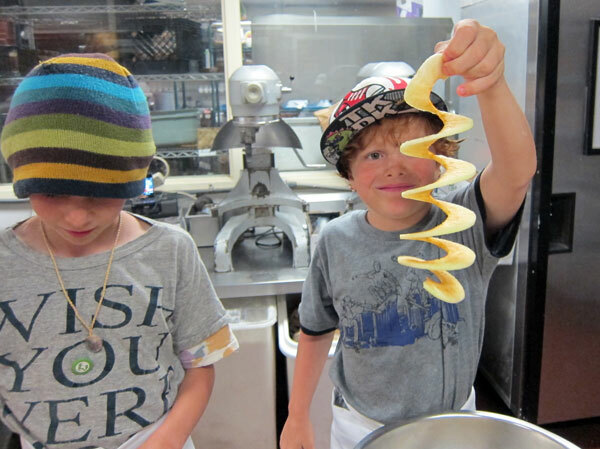 For Rémy a lasting memory was peeling, coring and slicing all the apples to make “apple slinkies” and when we returned home I immediately ordered our very own medieval torture apple slicing gadget, just like Chef Linda’s R & M Industries 5920 Apple Peeler/Corer/Slicer ). Our first weekend back Minty asked to make pie again, so I guess she enjoyed her class. Here’s a little video demonstrating quite how easy pie making is and showing the fun Minty and Rémy had in the Pastry Kitchen with Chef Linda. Thank you to Chef Linda and to her helpers in the kitchen at Hualalai for teaching Minty and Rémy the art of pie making. The pies were delivered to our room at the resort that night and both children proudly presented them to papa for his birthday. And here’s the all important recipe so you can have a taste of Hawaii back home. 1. In a large bowl, toss together the flour and salt. Using fingers, a pastry blender or two knives, cut in the shortening until the mixture is mealy (about the size of peas). 2. Sprinkle in 7 tablespoons iced water and stir with a fork until the dough comes together. If it is too dry and crumbly, add the remaining water, one teaspoon at a time. 3. Halve the dough and pat it into two 7 inch disks. Wrap each disk in plastic wrap and refrigerate until chilled, about 30 minutes. 4. Arrange one rack in the bottom third of the oven and another in the middle. Preheat the oven to 450F. 5. 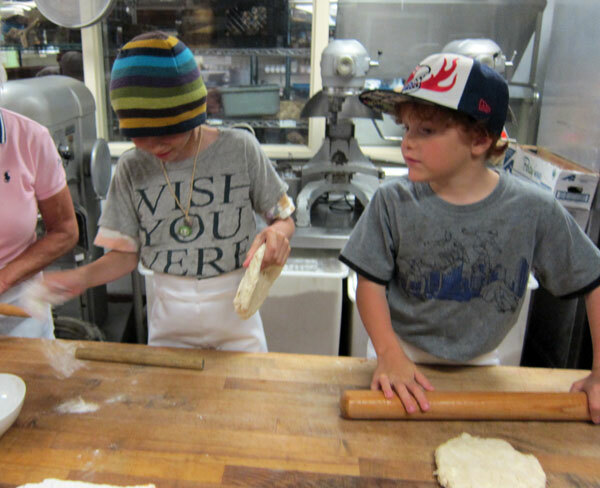 On a lightly floured surface, roll out one dough disk into an 12” round. Transfer to a 10” glass pie plate. Do not trim the overhanging dough. Refrigerate the second disk and the pie shell until the filling is made. 6. In a bowl mix together all the dry ingredients for the filling. 7. Peel, core and slice the apples (we used this new gadget like Chef Linda’s R & M Industries 5920 Apple Peeler/Corer/Slicer ). Toss the apples in the dry ingredients. Place half of the apples in the bottom of the pie trying to layer them flat. Top with a layer of pineapple. Finish with the rest of the apples. Dot the top of the apples with small pieces of the cold butter. 8. Wet the rim of the pie shell with a brush or with your fingers. 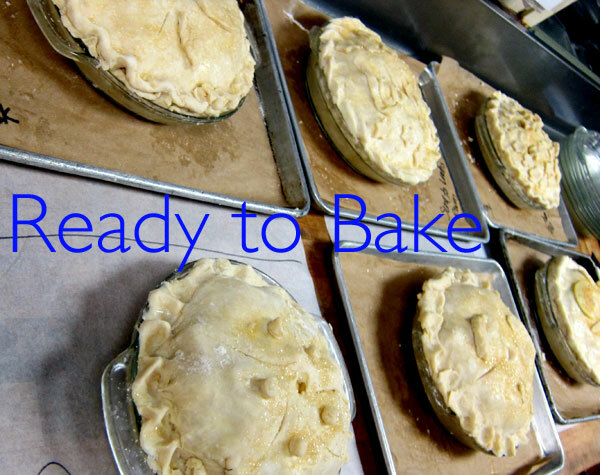 Place the top layer of pie dough over the pie by folding in half and gently placing over the filling or by rolling over a rolling pin and placing on top. 9. Fold the top crust under the rim of the bottom crust and press together. With your fingers crimp an edge around the pie. Cut a slit or a hole in the top to let the steam out. Decorate with any left over bits of dough or some apple slices. With a pastry brush cover the top crust with a small amount of milk and sprinkle with sugar. 10. Bake in the oven for 10 minutes and then lower to 425F and continue to bake for about 45 min or until the bottom crust is golden brown and the apples are tender. What a fun experience for all of you. I love the Hawaiian twist on a traditional apple pie. That pie sounds so Hawaiian — and it looks like the kids were having a ton of fun! What a great experience! Such wonderful flavors as well! Can’t wait to try. 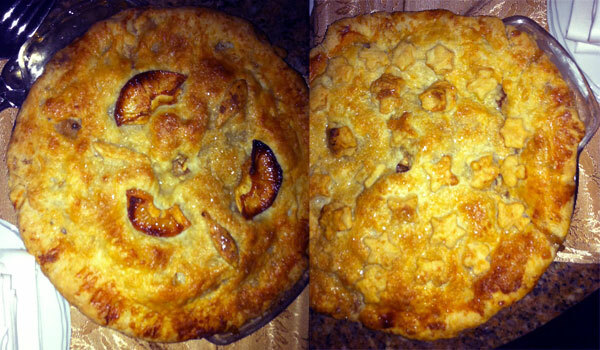 will bring back delicious memories of the pie class we all did together with Evan – ahhhh! what a fun way to spend time with your family. these are the memories that they are going to remember and cherish. And making a pie and eating it is another wonderful family activity I am sure shared by all! What a fun experience for the kids! I dream of that pie sometimes. One of the best I’ve ever had. I just dream of Hualalai!!! oh and pie – make one with your girls you know they will love it – have you developed a grain free pastry recipe yet?